Most all evangelical Christians have every hair on their body raised in bewildering excitement after reading just the title of this article. That's because most every evangelical Christian today believes in the rapture, so to say anything contradictory against it is an outrage. But I challenge you to clear your mind of traditions taught by men and to look with open eyes at the Word of God, not man's traditional systems of belief. With all sincerity, I propose that nowhere in the Bible is there any such mention of the rapture; moreover, any interpretation stating such is a false doctrine. Now please, hear me out. I ask that you do not take my word for it, but that you seek for yourself the Word of God and find out the truth. If you indeed seek Him, you will find Him. The word "rapture" comes from a medieval Latin word raptura which means "seizing and carrying off" (google.com). There are some unknowns surrounding the exact history of the word, but there have been historical accounts of this doctrine preached even as early as the time period of the Apostles, although not by the Apostles themselves (ucg.org). In 373 AD a person by the name of Ephraem of Nisbis stated the following: "For all the saints and Elect of God are gathered, prior to the tribulation that is to come, and are taken to the Lord lest they see the confusion that is to overwhelm the world because of our sins" (ucg.org). This was one of the first recorded references to the supposed rapture of the Bride of Christ. Later, during the time of the Protestant Reformation, talk of the rapture emerged again by church leaders responding to problems with other doctrines (ucg.org). This early church tradition of the rapture held fast to an idea that "God's people could be spared the terrible time of wrath that God would pour out on the earth by removing the saints. The saint's departure from the earth would occur so they would not undergo the terrible wrath at the beginning of the judgments of God upon the sinful unbelieving world" (ucg.org). However, the tradition of the rapture is still not referenced anywhere in the Bible by Jesus or by any of the apostles. Perhaps one of the most well-known passages often referenced as proof of the rapture is found in I Thessalonians 4:17. Written by the Apostle Paul to the church in Thessalonica, verses 13 through 18 say the following: "We do not want you to be uninformed, brothers, concerning those who are asleep, so that you will not grieve like the rest, who have no hope. Since we believe that Jesus died and rose again, in the same way God will bring with Him those who have fallen asleep through Jesus. For we say this to you by a revelation from the Lord. We who are still alive at the Lord's coming will certainly have no advantage over those who have fallen asleep. For the Lord Himself will descend from Heaven with a shout, with the archangel's voice, and with the trumpet of God, and the dead in Christ will rise first. Then we who are still alive will be caught up together with them in the clouds to meet the Lord in the air; and so we will always be with the Lord. Therefore, encourage one another with these words." But what is Paul talking about? Paul is talking about the Christians already with the Lord in Heaven, those who died physically. 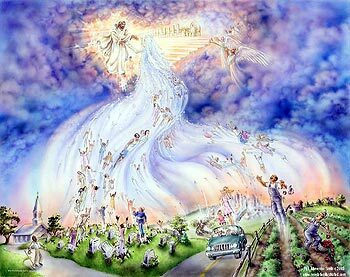 Together with Jesus, these deceased saints will come back with Jesus to set up His Kingdom on the earth at His second coming. They are the ones who are already dead and "in Christ will rise first" since they are already with God in Heaven. Then, we who are still physically alive on the earth will rise to meet them all at their coming in the air, being made alive spiritually AFTER those who were already dead and with the Lord at His coming. Paul is not speaking of the rapture, which will never happen because God never speaks about it. Paul is speaking of the awesome return of our Lord Jesus Christ. When one reads the passage again with a clear mind, the interpretation I gave makes sense; however, when one tries to fit previous teachings of the rapture into the Word of God, one is left with an incomplete interpretation that does not make contextual sense. Jesus often spoke of the signs of the end of the age. There are too many lengthy explanations to go into each passage regarding the end times; however, I will tackle two of them. The first passage is Matthew 24. In Matthew 24, Jesus says that first the tribulation (persecution against the Church) will take place (verse 9). This point in itself is interesting because John in Revelation 1:9 says he was "a partner in the tribulation, kingdom, and perseverance in Jesus." This is interesting to note because the tribulation is not something that is coming; I believe we are in it and have been in it ever since Jesus ascended into Heaven over 2,000 years ago, an understanding the Apostle John clearly understood. Continuing in Matthew 24:10-14, Jesus says that, during the tribulation, the love of many will grow cold. Then, at the end of the tribulation, the "abomination of desolation" (verse 15) will take place, at which the tribulation will be stopped (verse 29). If it had not been cut short, there would be none left alive, says Jesus. But why will the tribulation stop? It will stop because the "sign of the Son of Man" will appear (verse 29), meaning that Jesus will appear returning the same way He ascended in Acts, gathering the elect to Himself (verses 30 and 31) and setting up His righteous Kingdom. Matthew 24 says nothing of the "rapture." Why? Because such an event will not happen. As Matthew 24 continues, Jesus says to pay attention for the day of salvation (equivalent to the "day of the Lord" and the "coming of the Lord"), for it is coming quickly, just as in the days of Noah (verses 36-44). In order to understand this, one must look at what was happening in the days of Noah. In Genesis 6, we see that no one paid attention to God. "All they did was evil." In the last days, as Jesus says, the world, like Noah's neighbors, will continue to live their lives unprepared for the destruction God has promised and warned the world about. In the same way, when the flood came, the unbelievers were swept away because they had not prepared for that day of destruction; that is, except for Noah and his family. With the context in place, it makes sense that people in the last days will be caught unaware at the second coming of the Lord, when Jesus comes to set up His Kingdom and judge the world according to their sin. For two people to be in a field, one to be taken and the other to be left, is to be understood in the context of the story of Noah and the flood. Jesus is saying to "stay awake!" and be prepared for meeting the destruction of the world, just as Noah was in his day. Just as people were living their lives, working and eating and drinking, so will people be when Jesus returns. Lastly, for one to be taken and one to be left further symbolizes the separation that will be made between the believers in Christ and the non-believers. What a day of wailing that will be (Revelation 1:7). Finally, in Matthew 25, we read that as soon as Jesus comes to the earth with His followers, He will immediately begin to judge and establish His Kingdom (verses 31-33). He will not sneak a peak out of the clouds at His Bride; He will come in awesome power and in great glory for her! In conclusion, one of the most important passages to study when finding the truth of the coming of Christ can be found in Acts 1:9-11. "And when He had said these things, as they were looking on, He was lifted up, and a cloud took Him out of their sight. And while they were gazing into Heaven as He went, behold, two men stood by them in white robes, and said, 'Men of Galilee, why do you stand looking into Heaven? This Jesus, who was taken up from you into Heaven, will come in the same way as you saw Him go into Heaven" (Acts 1:9-11). There are two thoughts to consider in order to fully understand this passage: 1) Jesus promised His coming again (Matthew 16:27, Luke 9:26, Matthew 24:34-36, Mark 13:46-47, Luke 21:34-36) and 2) the angels said Jesus would return the same way He ascended into Heaven. Jesus promised to come again. When He comes, He is not only showing Himself to His followers and then retreating again into Heaven. No! When Jesus comes, He is returning to set up His Kingdom. He will come in power and immediately begin to judge the earth according to His holiness. Jesus' first coming was His birth. His second coming will be His return. There is no in-between "rapture" spoken of in the Bible. There is no third return spoken of either. All in all, it is with great urgency I plead with my fellow brothers and sisters to read and study the Bible, allowing the Holy Spirit to teach you with truth and all wisdom and understanding. Beware the false teachers and their false teachings - they come to you in sheep's clothing, but they are really ravenous wolves (Matthew 7:15). Study the Bible for yourself, oh Church! Do not rely on another man (even this article!) to set up your beliefs! God is personal and He will teach you according to all truth. "Behold, I am coming quickly!" (Jesus).